The town of Dambulla in Sri Lanka is home to the largest cave complex in the country. With a labyrinth containing over 80 documented caves, five in particular stand out from the rest. 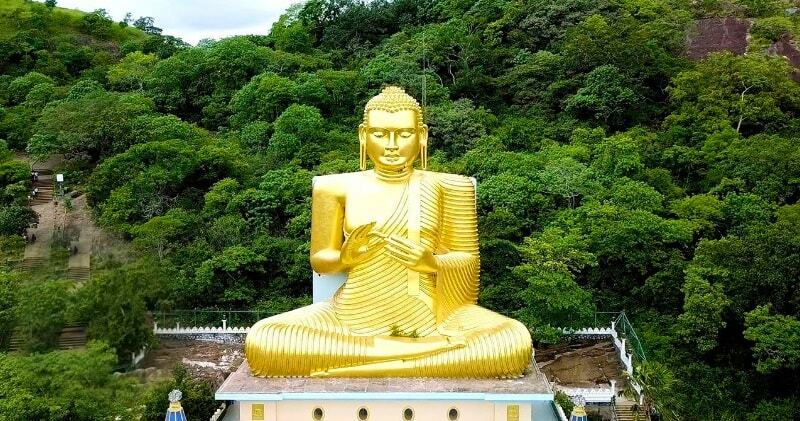 Unlike the others, these five have been converted into sprawling temples where visitors can view golden statues, depictions of Buddha and over 1,500 different paintings. The temple caves have been around for 22 centuries; thanks to conservation efforts, they will be around for many more to come.There are a total of 153 Buddha statues, three statues of Sri Lankan kings and four statues of gods and goddesses. The latter include Vishnu and the Ganesha.Prehistoric Sri Lankans would have lived in these cave complexes before the arrival of Buddhism in Sri Lanka as there are burial sites with human skeletons about 2700 years old in this area, at Ibbankatuwa near the Dambulla cave complexes.